9 years -> 3 months -> 1 week -> 2 days. filled with lethargy and loathing. He got the parting golden watch, a good pension, and false freedom. Imagine his dismay when nothing changed. 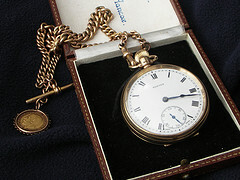 The 30-year golden watch had actually filled his days. The countdown ended without liftoff. Retirement was much like working. Into the time we have. We will live better in a future time or place. Followed by 30 years of not. Poem by David Zinger – David Zinger is a leading expert on employee engagement. He is committed to creating authentic and sustained employee engagement for the benefit of all. Contact David at (204) 254-2130 or Email dzinger@shaw.ca. Love the poem! It’s so telling as to living in the now. And something about this poem really drives that point home – well said! I am glad something caught for you in the poem. It was based on a specific individual I knew years ago. I love the Jungle of Life I share some mutual admiration for your work. Hello David- just discovered you on twitter. You have some interesting insights on employee engagement. I enjoy reading your posts. We are in the recognition business and we understand the value of an engaged employee. We believe recognition is key. Do you have articles/research that I can post on our blog or RT on twitter re: employee engagement as it relates to recognition or lack thereof? Always looking for new resources. I believe there are very strong links between appreciation, recognition, and engagement. I am working on some of this during the summer. I will email you a poem I did on this topic.